Taking KLIA Ekspres from KL Sentral to KLIA2 is the fastest way to get to the Kuala Lumpur International Airport 2 (KLIA2) located in Sepang. Malaysia Airports Holdings Berhad is the company responsible for operating the KLIA2 airport. Although you can go from Kuala Lumpur to KLIA2 by shuttle bus with cheaper cost, the heavy traffic in Kuala Lumpur city is common in Malaysia and you might get trapped in the traffic jam for hours. By taking KLIA Ekspres from KL to KLIA2, you will arrive in KLIA2 Terminal in only approximately 33 minutes. KLIA Ekspres from the KL city center departs from KL Sentral. Scan the QR code sent to your Booking Confirmation Email when you book online to enter the gate. The train will stop at KLIA Station first before proceeding to KLIA2 Station. The journey from KLIA to KLIA2 takes around 3 minutes. The arrival point is at KLIA2 Station, which is located inside the gateway@klia 2 Mall on Level 2. The KLIA2 Departure Hall is on Level 3. KLIA Ekspres train has a frequent schedule. During peak hours, the train is available every 15 minutes. During off-peak hours, the train is available every 20 minutes. Meanwhile, after midnight the train is available every 30 minutes. The first train from KL Sentral is at 5:00 AM and the last train is at 12:40 AM. KLIA Ekspres online ticket booked from BusOnlineTicket.com is valid per one entry for one day and you can board the train at any departure time on your selected departure date. BusOnlineTicket.com is offering KLIA Ekspres tickets online. 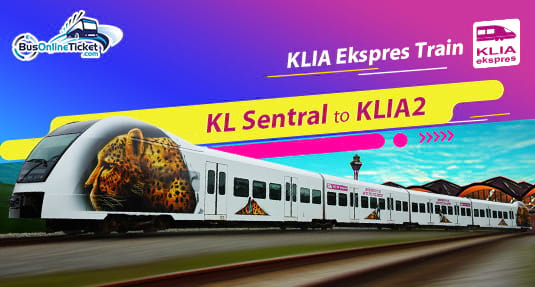 Book your KLIA Ekspres online tickets to ensure a smooth journey and save more with BusOnlineTicket.com. Booking confirmation will be sent to your email once we receive the payment. Printing the ticket is not compulsory as long as you can scan the QR code to the QR code reader on the gate.